Skeletoon have returned with a third album titled "They Never Say Die", a concept album that is based on the film known to many as "The Goonies"! The album will be financed by YOU through the funding platform Music Raiser, but the real "companion" is the adventure of this whole deal, you having to lead the band through the story! Check out the first web episode of the new web series "Skeletoon-ies" where you will discover "One Eyed Willy's secret treasure. But that's not all, you will have to vote the ending you want the band to choose, meaning you can change the plot and make the story go better or worse! So, bewise and remember the future is in your hands! Go on https://musicraiser.com/it/projects/9749-they-never-say-die-i-goonies-del-metal to ensure your part of the final prize, supporting our campaign. 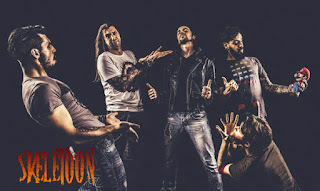 Stay connected on https://www.facebook.com/Skeletoonband/ EVERY SATURDAY AT 14 PM (CET) for a new episode and a new "Choosing Session" of your favorite nerd metal web series. You can vote in every moment, how many times you want until MARCH 16th, Hr. 23.59: then "The choice has been taken", and you can watch the results for the following episode, the day after. Enjoy, and remember: The Goonies Never Say Die! Find out more and fund this album via Music Raiser here: https://musicraiser.com/it/projects/9749-they-never-say-die-i-goonies-del-metal.